A well-balanced wardrobe includes what I call cake and icing. Sounds delicious, doesn’t it? The cake of your wardrobe are the wardrobe classics. These are the pieces that are available in some version year after year. They include a white cotton shirt, a blazer, a cardigan, quality t-shirts, a pencil or a-line skirt, jeans, a leather handbag, a pair of pumps and a pair of flats or loafers. The design and fabric of these pieces change a bit over the years, but you will always be able to walk into a store and find them. The collage below, which I created in Polyvore, shows you two types of dresses, one is a wrap style, which is fitted through the waist, and the other is a shift style, which flows over the waistline. Every woman regardless of her age and her lifestyle should have one dress that fits her well and makes her feel like a million bucks. Not to be overlooked in our list of classics, one should own either an overcoat or a trench coat. The coat in this collage is something of a cross between a classic wool overcoat and a trench coat. While wardrobe classics are great, they often lack flair. This is where the icing comes in. The “icing” in the collage below (created in Polyvore) may not be your flavor, but the point is, the icing includes the pieces that show others who you are. The icing most accurately communicates your personal flair and style. 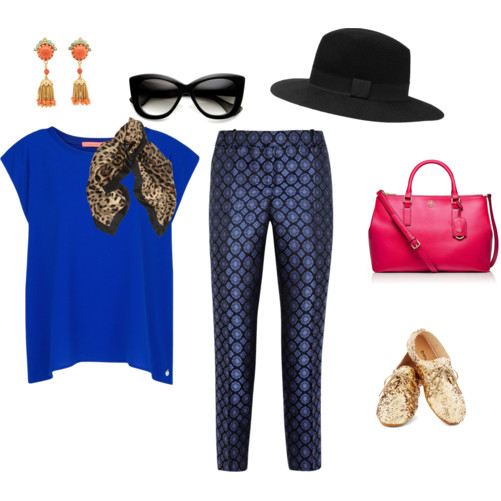 These pieces mixed with classics create interesting outfits. Some of us are cake girls, and some of us are icing girls. And some of us like both! Guilty! We may find ourselves with too much cake and not enough icing or vice versa. Assess your wardrobe for cake and icing. If you are lacking basics and classics, it is difficult to create outfits, as an outfit often begins with basics. On the other hand, not having the icing to give your look its flair will leave you feeling like your outfits are boring. If you identify an imbalance, make a wish list and start shopping. The spring and summer deals are heating up. If you need help assessing your wardrobe, call me. We’ll determine your best pieces and make a shopping list together. A well-balanced wardrobe is a must!